Over 1,000 Nursing Associates will begin training this year in a new role that will sit alongside existing nursing care support workers and fully-qualified registered nurses to deliver hands-on care for patients. The Institute of Vocational Learning (IoVL) at London South Bank University (LSBU) will lead on two training programmes, collaborating with Bart’s Health NHS Trust alongside other organisations in East London in a rounded program that will give trainees experience in mental health, community health and secondary care. As well as partnering with Great Ormond Street Hospital for Children Foundation Trust to deliver a Nursing Associate programme that will focus on children and young people. The role was developed based on recommendations made through the Shape of Care review, to create a new type of care worker with a higher skillset that will assist, support and complement the care given by registered nurses. 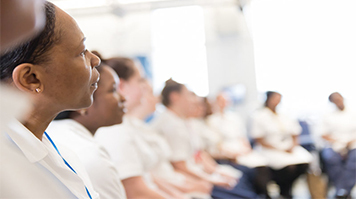 The training will begin in December and run over a two year period, with the plan to eventually create 2,000 Nursing Associate roles across England. Find out more about the Institute of Vocational Learning (IoVL) at LSBU.